Because it’s the sole form of legal identification recognized all over the world, one of the most stressful things that could happen abroad is losing one’s passport. If this happens to your assignee or a member of their family overseas, it’s important that they know how to go about getting a new one: they’ll need a U.S. passport to enter back into the country when their assignment is over. In case of a lost or stolen passport, assignees should file a report with the nearest U.S. embassy. While there, U.S. embassy officials will assist them with the process of obtaining a new passport. To receive their replacement passport, they will need most of the documents they used to apply for their original passport. This includes a passport photo, government identification, evidence of U.S. citizenship (birth certificate, photocopy of U.S. passport), travel itinerary, DS-11 application and the DS-64 Statement of Lost or Stolen Passport document. Before traveling abroad, be sure to remind your assignees to gather all of the documents that you would need to apply for a new one in case this happens. Having these documents on hand will make the replacement process easier and less stressful should they need new passports. Traveling abroad for an extended amount of time might seem like the opportunity of a lifetime - and it is! But before your assignee goes abroad, it’s important for them to know what to do should they or one of their family members get sick or injured. Nobody plans on getting sick or hurt abroad, but being prepared for a medical or health issue can help make the situation easier to fix. Before traveling, advise your assignee to take stock of the medical conditions they suffer from, if any. Do they have asthma or allergies? What medications are they taking regularly? Finding simple medications like antihistamines or dramamine could be difficult depending on where your assignee is headed. Advise them to pack copies of any prescriptions they have, as well as an extended supply of things like inhalers, allergy medicine and medication prescribed by their family doctor. Encourage them to look up whether or not their medication is approved for use in the country they’ll be visiting as well. If it isn’t, help them locate an English-speaking doctor who can assist in identifying a suitable replacement. It’s also smart to advise your assignee to learn a bit about their host country’s medical system, some medical vocabulary and where the nearest hospital is located—especially if they’re traveling with children. Parents who know how to communicate that their son is allergic to penicillin and where to find the closest emergency room will be less stressed should their child become ill or hurt themselves while abroad. Just like at home, crime can happen when assignees are abroad. Because each country handles crime differently, it’s important that your assignee knows what to do should they become a victim of a crime, big or small, overseas. Explain to assignees that they should always contact the nearest U.S. Embassy should they encounter a crime while abroad. The U.S. Embassy can help explain local criminal justice procedures, contact local authorities, connect you with English-speaking lawyers and make available U.S.-based resources for victims of crime. From here, they can discuss with local police how to move forward and what the next steps will be. 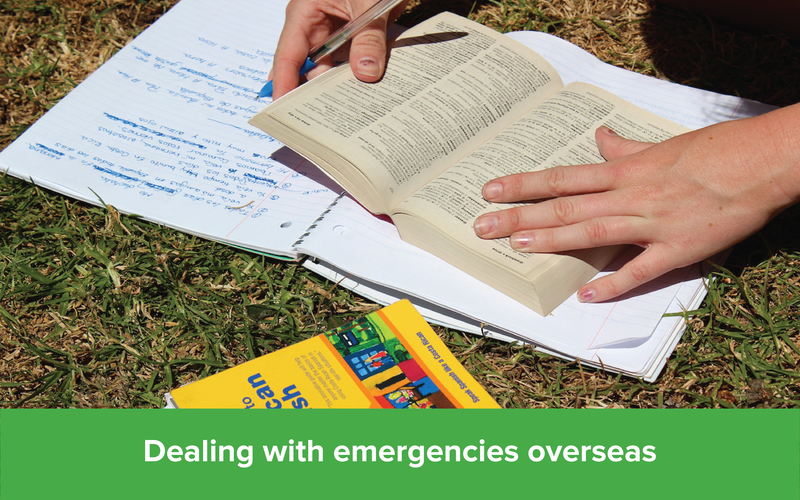 Dealing with emergencies abroad can be extra stressful for assignees due to language barriers and being unfamiliar with their host country’s processes. The best way for them to mitigate that is to be prepared. Knowing what to do before an emergency happens abroad will make them less likely to panic and more likely to get help more quickly. Interested in finding out if your assignee is adjusting well to life abroad? Download our slideshare to learn about how language and culture learning supports a successful relocation.